This wine gets its inspiration from the great white wines of Chablis, interpreted through the unique conditions on the North Fork. After the alcoholic fermentation, malo-lactic fermentation is blocked by maintaining low temperatures in order to maintain bright acidity in the wine. During the first six months of aging in small stainless steel barrels (88 %) and seasoned French Oak (12%), the lees are stirred on a regular basis to enhance the structure of the wine on the palate. The wine is bottled ten months after harvest. 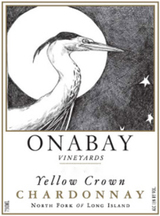 The 2013 Yellow Crown Chardonnay is mostly unoaked, although 10% was stored in well-used French oak. It comes in at 13% alcohol. Fruity and very tasty, this fresh, young Chardonnay is nicely done. It is not particularly profound or intense. It just tastes great for early consumption. However long it theoretically lasts, drink it young and you likely will think it exceeds expectations. There were 238 cases produced.